He married Ruth Hinshaw, 1808.1,2 Ruth Hinshaw, daughter of Jesse Hinshaw & Mary Marshill, was born 4-17-1791, Chatham County, North Carolina.1,2,6 William & Ruth were third cousins. 1 male age 10-15 (Martin). 1 male age 15-20 (Zimri). 1 male age 50-60 (William). 3 females age 5-10 (Jemima, Malinda, Dinah). 1 female age 10-15 (Delphina). William Hinshaw, age 59, born in North Carolina; farmer; $700 real estate. Martin Hinshaw, age 23, born in North Carolina. Melinda Hinshaw, age 18, born in North Carolina. Dinah Hinshaw, age 15, born in North Carolina. 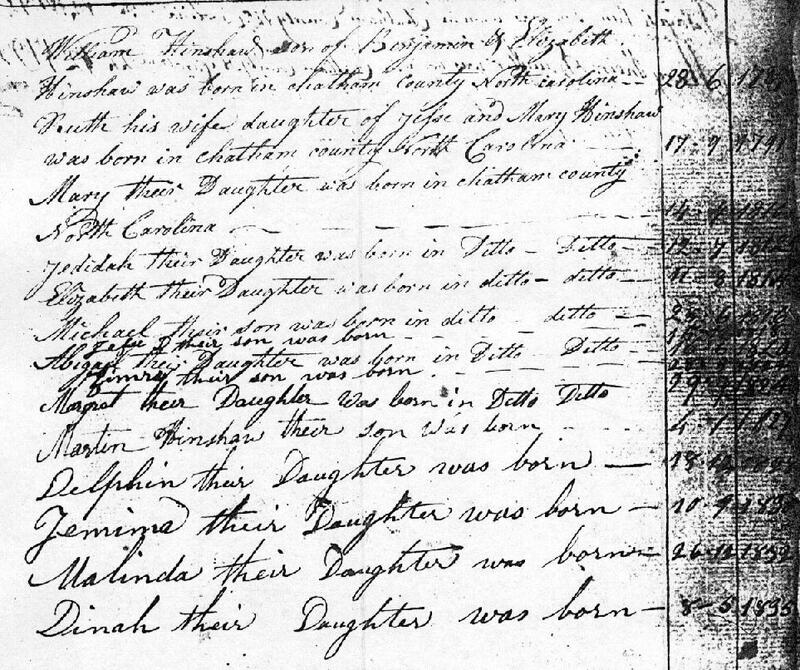 1840 census, Chatham County, North Carolina; roll M704-357, page 143. 1850 census, Upper Regiment, Chatham County, North Carolina; roll M432-624, page 382A, line #17, dwelling #463, family #464. 1850 census, Upper Regiment, Chatham County, North Carolina; roll M432-624, page 382A, line #11, dwelling #462, family #463. 1850 census, Upper Regiment, Chatham County, North Carolina; roll 624, pg 385, family #517. 1850 census, Upper Regiment, Chatham County, North Carolina; roll 624, pg 382, family #467. 1850 census, Upper Regiment, Chatham County, North Carolina; roll 624, pg 382, family #468.